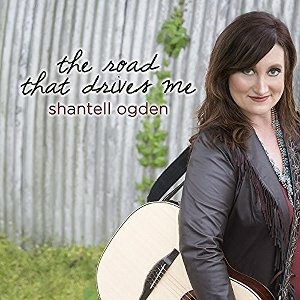 Award-winning singer-songwriter Shantell Ogden has had her songs featured in several feature films and the hit CW series Hart of Dixie. Over the course of her career to date she’s released four albums and picked up Songwriter of the Year and Americana Song of the Year at the IMEA Awards in 2015. New release The Road That Drives Me is Ogden’s fifth album and it features 8 new tracks, all of which are co-written and produced by her. The Road That Drives Me opens with Truth About Trains, a mid-tempo number that compares trains to men. The track isn’t one of the stronger ones included here but it gets the record off to a pleasant enough start. Title track, The Road That Drives Me, has stirring production and could easily be a single in the future. The acoustic ballad Love Again is one of the highlights on the record accompanying Ogden with guitar riffs. One of the issues that I had with the album is that at times Ogden’s voice doesn’t sound powerful enough. She’s more comfortable in the softer moments of the record but when she’s required to belt or employ vibrato, her voice is lacking. In some moments she actually reminds me of Nashville’s Rayna James (Connie Britton). There’s a nice quality to her voice but sometime when it’s stretched it sounds a little flat and lacking in depth. The song on the record that suits Ogden’s voice best is Devil Comes Knockin’, which is a little more rootsy with an injection blues. Her voice floats nicely over the driving beat and packs a bit of attitude into her delivery that serves her really well. The Road That Drives Me is a pleasant collection of songs. Ogden is a solid songwriter and her production shines on this release. For me though, I prefer a stronger voice from a Country singer and Ogden left me wanting. That’s not to say this album isn’t worth your time, it absolutely is, but it’s more for those who enjoy good songwriting than power vocals.